Ternopol Mayor Sergei Nadal was asked why Svoboda supports the recognition of descendants of former members of the Ukrainian 14th Division of the Waffen SS as national heroes. “These Ukrainian heroes must be honoured irrespective of what has been written about them in the history books of those peoples who were once our enemies,” Nadal answered. World War Two left too many stories of human misery. Amongst them was the ethnic cleansing carried out in Nazi occupied Poland by the Ukrainian Insurgent Army (UPA). This reached its peak in 1943, when the UPA Commander ordered the liquidation of the male population, ending in the murder of around 100,000 Poles, the majority of whom were actually women and children. These killings were carried out by the faction of UPA under the leadership of the Ukrainian nationalist leader Stepan Bandera. Fighting alongside the German Nazis, who promised them a post-war independent Ukraine, their aim was to purge their future state of all non-Ukrainians. Thankfully, the Nazis and their allies were ultimately defeated and UPA was never able to realise its dream of an ethnically pure Ukraine within a Nazi controlled Europe. The current crisis in Ukraine affects Poland perhaps more than any other European country. Poland and Ukraine share a common border and are economically, culturally and historically entwined. Large areas of western Ukraine belonged to Poland before the war and cities such as Lviv continue to be seen by many Poles as central to their cultural heritage. About 1/5 of all the country’s exports go eastwards to Ukraine and Russia; and hundreds of thousands of jobs depend on this eastern trade. Ukraine is also a country of particular strategic importance for a government that bases its foreign policy on the pre-war conception of having buffer states to its east that are independent of Russia.Anyone who understands Polish history and society would have expected it to have taken a firm stance against Russia in this crisis. However, this has been accompanied by an overall silence on the role played by the far-right in Ukraine. And there is much for Poland to be concerned about. The far-right organisations Svoboda and the Right-Sector played a central role in the Maidan protests, which increased as they became more radical and violent. 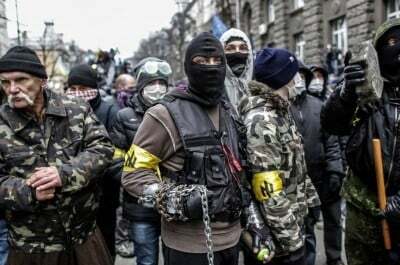 Although the far-right was a minority on the Maidan demonstrations, their reputation and prestige rose as they were at the forefront of fighting with the hated Berkut. These parties have strong neo-Nazi roots and connections to other fascist parties in Europe. They also openly display the black and red flags of UPA and portraits of Bandera (one such banner was hung in Kiev’s town hall). They are organised on the streets and are now strongly embedded in Ukraine’s new government alongside the supporters of the west’s favourite oligarch Yulia Tymoschenko. Seven Ministries in this government are occupied by the far-right (including defence and national security) and they have four Regional Governors. The silence on the coming to power of fascists, who lay claim to the tradition of UPA and Bandera, has partly been in response to the claims from Moscow that there has been a fascist coup in Kiev. A war of words has begun with many in the west (including Poland) countering these assertions: the far-right is just an insignificant minority; they have reformed themselves and are no longer fascists; those carrying the symbols of UPA do not understand their historical meaning; the far-right also exists in Russia, which has no right to criticise Ukraine; these are just lies spread from Moscow in order to justify Russian expansionism. Some of the claims coming from Moscow may indeed be exaggerated. Fascism has not come to power in Ukraine, and initial reports of wide-scale anti-Semitic attacks were unfounded. However, in a period of economic and political crisis a fascist movement has gained a foothold both on the streets and in government. This is intensifying tensions with those in the east of the country who feel threatened by political forces who have an overtly hostile attitude towards the Russian speakers in Ukraine. Such political forces are a dangerous and destabilising force in a country wrought with divisions and potential points of conflict. The recent killing of two people in the eastern city of Kharkov by Right-Sector gunmen is an example of how the situation could spiral out of control and widen the conflict. In this situation it is imperative that Poland finds an independent voice that includes a condemnation of the far-right. If it is really true that those holding the flags of UPA do not understand their historical meaning then the Polish government has a duty to inform them what this is in the strongest possible terms (as it does for example whenever Auschwitz is referred to as a ‘Polish concentration camp’). It should also openly distance itself from those political parties in government who lay claim to the political heritage of UPA. Those in the west who have long forgotten the crimes carried out by Ukrainian nationalists in collusion with the Nazis must be told about who they are now backing in Ukraine. Poland has a unique perspective in this crisis and it should be loudest in condemning the far-right in Ukraine and anyone who stands in the tradition of UPA and Bandera. The west has long intervened in other countries, supported extremist elements and then stood back at a distance to watch the ensuing chaos. Poland does not have such a luxury and may soon find itself having to deal with a divided country on its border which is in perpetual economic crisis and social disorder. Ideal breeding ground for supporters of fascism. The Polish government should also beware of the threat that the far-right poses at home. Presently, the far-right remains an isolated force, unable to find an independent space in a political scene dominated by two parties from the conservative right. However, they have become increasingly visible on the streets, not least when tens of thousands attend the annual Independence Day march in Warsaw. The majority of these demonstrators may not be fascists, but they are led by a strong core of supporters of far-right organisations in collusion with groups of football hooligans. At last year’s march, these radical elements burned down a rainbow structure that was seen to symbolise lesbian and gay rights; attacked a squat and surrounded and laid siege to the Russian embassy. Members of far-right organisations have increasingly attempted to disrupt (sometimes violently) public lectures and meetings, including a lecture given by Zygmunt Bauman last year at Wrocław University. Liberal mainstream opinion has been very vocal in opposing these actions in Poland and has seen them as a threat to the country’s democratic system. However, at the same time hardly a whisper of condemnation has been made when the very same political forces have led violent confrontations with the police in Ukraine and then become a central element of its new unelected government. Some prominent Polish politicians even chose to share a political platform on the Maidan with leaders of the far-right, alongside UPA flags. This year is the seventieth anniversary of the Warsaw Uprising, the largest and most bloody uprising against fascism in which around 150,000 Poles died. Poland suffered more than any other country at the hands of fascism, with millions killed, many of its cities destroyed and German Nazi concentration camps situated on its territory. To remain silent or downplay the growth of fascism in Ukraine today is taking the mantra of an ‘enemy’s enemy is my friend’ to its absurd extremity. To oppose the far-right in Ukraine and to condemn anyone raising the banners of UPA and Bandera does not make one automatically a friend of Putin. With the west remaining largely silent on the rise of fascism in Ukraine, a strong anti-fascist voice is urgently needed from Poland.